I’ve come up with a few ways to be more environmentally conscience this holiday season with what you use to wrap gifts. 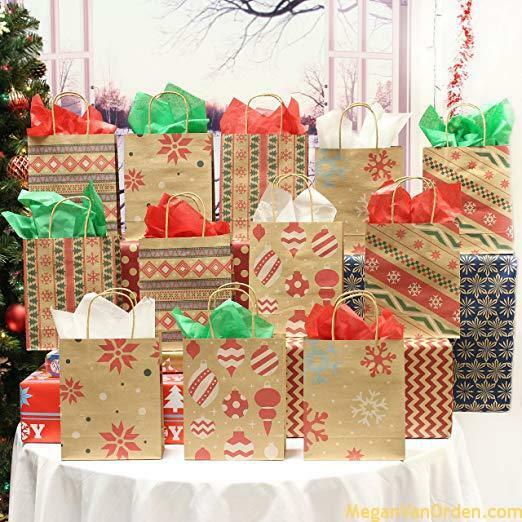 Wrapping paper is often dyed, laminated and/or contains non–paper additives such as gold and silver coloured shapes, glitter, plastics etc which cannot be recycled. … A lot of wrapping paper has sticky tape attached to it which makes it very difficult to recycle. So most of the fancy stuff is a no no if you are trying to be good to the environment. Some creative ways that I have come up with are using Brown Kraft paper and Holiday Kraft paper bags. One of our family friends even recommended getting scarfs, which you can get pretty cheap at the outlet stores and using them to wrap gifts. Here are a list of other items that aren’t good for the recycling world. Ribbons again are an annoying item that brings recycling companies to a grinding stop. The processes used to separate other media has large spinning disks. Ribbons are one of the main problems where it gets rapped around the shaft like hair in a vacuum. Christmas Cards are paper but the sparkles and glitter that make them catch your eye are not. Cardboard Boxes however ARE a great material to recycle because it’s clean, easy to reprocess and every ton of it that’s reclaimed saves 17 trees! The most important thing when recycling boxes is simply to break them down flat. Otherwise they take up so much room in the recycling trucks that they have to make extra trips, requiring more energy and eating up all the good recycling would have done in the first place.